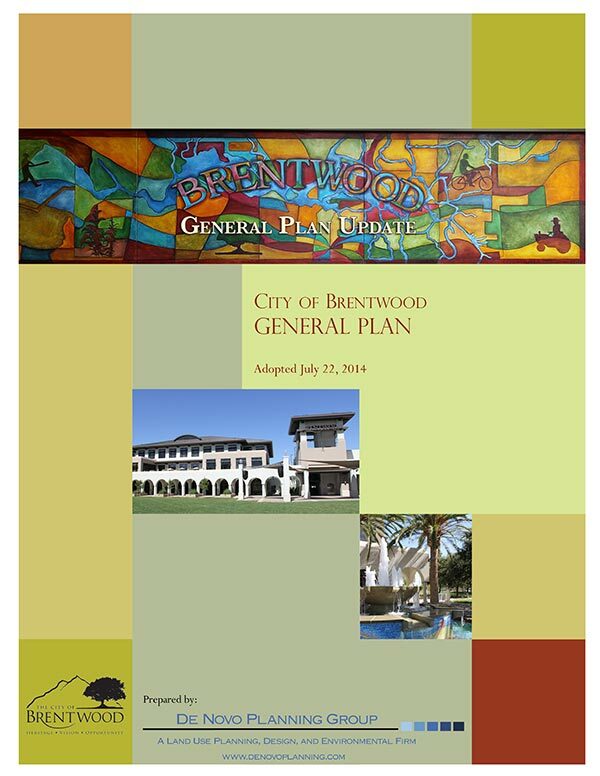 The De Novo team recently completed a comprehensive update to the City of Brentwood’s General Plan and preparation of a General Plan EIR. The work effort began with an extensive public outreach and visioning process and preparation of a detailed Existing Conditions Report. Other key tasks include an Opportunities and Constraints Report, three Land Use Map Alternatives accompanied by a Land Use Map Alternatives Report, and opportunities for property owners to submit parcel change requests. Our team worked closely with the City’s General Plan Working Group to complete comprehensive policy sets that reflected the City’s goals and priorities for each General Plan topic. The updated General Plan provides extensive opportunities for economic development, maintains strict fiscal sustainability, enhances the preservation of natural resources in and around the City, and ensures continued quality in the built environment under increasing growth pressure. We developed innovative solutions customized for the City’s unique needs, including the establishment of a Priority Development Area in the northwest area of Brentwood, along the SR 4 corridor. This area included detailed planning priorities and standards for the development of a mixed use area that would accommodate a range of business park uses, regional commercial uses, and a range of residential densities that would support the future extension of eBart to the area. The Brentwood General Plan Update Website can be viewed at: brentwood.general plan.org. De Novo Principals Beth Thompson and Ben Ritchie served as the project managers for the Brentwood General Plan and General Plan EIR, and Mr. McMurtry served as Principal Planner. Our team included W-Trans, BAE, JC Brennan and Associates, and Peak and Associates.